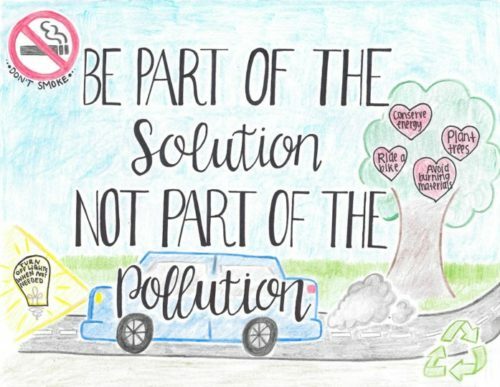 SAN DIEGO–Four hundred and fifty-two student artists from around San Diego county—the most ever—submitted their personal artwork to the County Air Pollution Control District’s (APCD) 2019 calendar contest to show the importance of clean air and how San Diego county can all fight air pollution. Thirteen works of art were selected by APCD judges to illustrate the district’s official calendar, which the district gives out free to the public each year. Every one of the kindergarten through 12th grade student artists who sent in their work will also receive a free calendar, and all of the artwork students submitted is featured on APCD’s website for everyone to see, including their friends, family and the public. One of the 13 pieces selected by the judges for the 2019 calendar will grace its cover and the remaining 12 will be featured inside the calendar, one for each month. APCD officials said they’ve printed out 1,500 calendars, most of which have been given out, and that the students’ artwork will help the district remind people how important clean air is throughout the year. APCD invited all students in the county in September to submit their artwork by Nov. 2 to be considered for the 2019 calendar. For more information about the Air Pollution Control District and their work to keep the county’s air clean, go to APCD’s website.